"An icon of division" is how one of the parliamentary candidates in Dudley describes the proposed location for a replacement mosque. He, along with many others, wants the town's Muslims - part of the community for over 50 years - to build somewhere else. 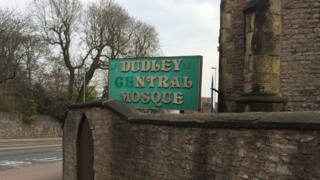 Mind you, on at least three previous occasions over the past 10 years, Dudley Borough Council has asked Dudley Muslim Association to switch sites, only for the alternative location to fall through. That's fed a suspicion that local politicians would really rather it wasn't built at all. At Friday prayers this lunchtime, I watched as families arrived at the existing mosque. It's a former Church of England School, with a couple of small minarets placed on top of the old chimney stacks, and a metal gateway inscribed with its purpose. Worshippers say space for 500 that in 1977 was sufficient is no longer adequate. The proposed new building would allow 750 people to pray indoors. The planning application, on derelict former industrial land, was finally approved at the end of last year. The land, however, is the subject of a court case, with the council saying it should be used by an employer who will create jobs. Kurshid Ahmed, of Dudley Muslim Association, told me they are willing to go to a different site yet again, but only if this time the council allows development to go ahead. He says time that could have been spent on bigger problems facing the community, such as radicalisation of the young, has been spent on what should have been a straightforward planning issue. All sides admit that, whatever the rights and wrongs, 10 years of this issue has done damage to what otherwise are good community relations. The English Defence League has organised protests in the town; a similar group, Britain First, intends to do so days after the general election. The parliamentary candidates are doing their best to ensure the mosque doesn't become an election issue. After all, issues like the economy and health are probably more important to voters in Dudley - including Muslims - than the saga of the mosque. Yet ignoring it is not the answer. Unresolved, it remains something outsiders can exploit - both those seeking to radicalise young Muslims, and those who want to stir up hatred or distrust of one of the areas oldest and best established minorities. In the past couple of days, I've experienced those sentiments first hand; the Muslim man from Birmingham who told me it was evidence of hostility to those of his faith; a man whose family came here from India but who blames Muslims for the deterioration of the area. It's a sensitive subject for sure, and resolving it will upset someone. Better, perhaps, to do that than leave it to fester and corrode trust in the political process for another 10 years.